See that fabric on the right? That is what I used to "pull" various pieces - I was hoping to use it for a border. Not so sure now - as is frequently the case. You should be liking it--it is looking so good! I "decoded" your blocks and am ready to start this scrappy star delight for myself!!! Great looking quilt!!! Thanks for the idea!!! I'm partial to scrappy and your blocks are gorgeous. I like the border, but I'm sure that you'll find the perfect one if that ones not going to be your choice. Isn't it amazing how quilts seem to have a mind of their own? Your blocks are great, so cheery. It's going to be a beautiful scrappy quilt....the best kind. Heee - I have several pieces in my stash now because they had been purchased with others as the border - and after the center was finished, I didn't like that border anymore. Amazing how that happens so easily! 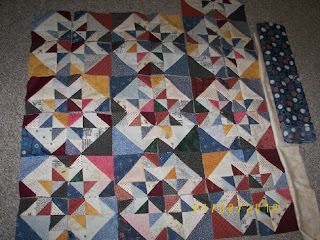 This is a wonderful scrappy quilt - just love its colors! I like that border. You are so good at this...! This quilt is coming together quite nicely. I like your color combos. I'm liking this quilt, too. Nice job. I'm liking it too - I remember it being so much fun to arrange the blocks and seeing the secondary pattern of the squares come out. Great looking blocks, Elaine! I love the scrappiness and the way that the stars pop out at you. Whenever I do a scrappy quilt, I find that whatever color I chose to be the border, THAT becomes the main color of the quilt, because your eye reads it that way. Maybe this gives you another clue to choosing the border for it. Ahhh--a scrappy quilt! somehow when you add bits from friends and the floor (hey--I once made almost a whole string quilt from scraps found underneath my quilting table) they end up making the best quilt! Glad this last spell of heat is done for a few days. No rain here--but I did get 1" last Thur at the camper. rats. I'd rather it rained on our corn and bean fields! What wonderful, sparkly blocks! And border fabrics--they so often seem like the perfect thing in theory, but then don't really work in practice. I'm struggling with that issue myself right now. Your blocks are beautiful, and I also love scrappy!